Please give us a call or send us an email. We enjoy receiving your comments and would be happy to answer any questions you might have about our exclusive range of oceanfront rooms and suites. Take Interstate 5 to Hwy 46 West. Switch to Hwy 101 North at Paso Robles, and then to Hwy 183 West in Salinas. Follow 183 West to Hwy 1 North, which will turn into Mission Street as you enter Santa Cruz. Turn left off Mission onto Bay Avenue. Turn left when Bay dead ends at West Cliff Drive and then immediately right onto Beach Street. 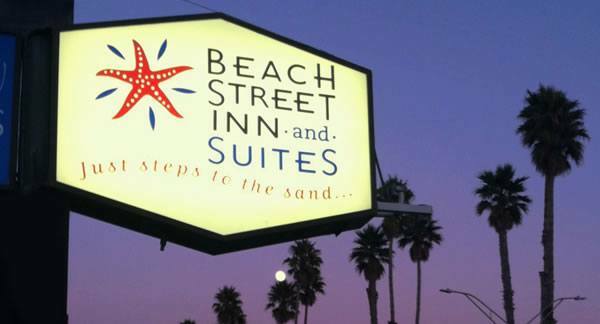 Beach Street Inn and Suites will be at the bottom of the hill and on the left, just past the entrance to the Santa Cruz Wharf. Take Interstate 280 South towards San Jose. Switch to Hwy 85 South, then Hwy. 17 South to Santa Cruz. Exit on Hwy 1 North to Mission Street. Turn left off Mission at Bay Avenue. Turn left when Bay dead ends at West Cliff Drive and then immediately right onto Beach Street. 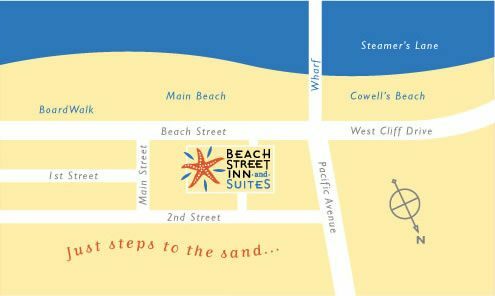 Beach Street Inn and Suites will be at the bottom of the hill and on the left, just past the entrance to the Santa Cruz Wharf.